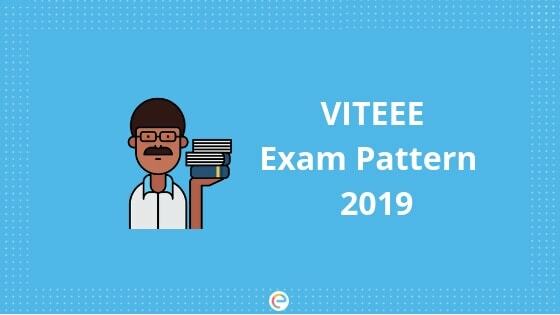 VITEEE Exam Pattern 2019 needs to be understood by aspirants before beginning the preparation. VITEEE Exam Pattern will help the candidates in preparing for the exam in a better and organized way. Through the VITEEE Exam Pattern 2019, the candidates will be able to know more details regarding the mode of exam, duration, sections, the total number of questions, marking scheme etc. As per the latest VITEEE Exam Pattern 2019, the entrance test will be conducted in the online mode in 3 sessions in different slots. Candidates can check below for more details on VITEEE Exam Pattern. Vellore Institute of Technology Engineering Entrance Exam (VITEEE) is an eligibility exam for various courses in VIT Campuses. VIT University is the main authority which organizes a university level entrance examination. This exam will be organized in 118 cities across India and abroad (Dubai, Kuwait, and Muscat). The exam will be organized through online mode. VIT University will conduct VITEEE 2019 online from April 10, 2019, to April 21, 2019. All the questions will be of Multiple Choice Questions (MCQs). There will be a total of 125 questions will be asked in the examination. Questions will be asked from Physics, Chemistry, Mathematics/Biology & English subjects. The exam will be organized in 3 sessions per day (Session I – 9:00 AM to 11:30 AM), Session II – 12:30 PM to 3:00 PM) & Session III – 4:00 PM to 6:30 PM). For every correct answer, one mark will be awarded. Paper is a Multiple Choice Question Paper. It consists of 125 questions in each of the PCM and PCB formats. 120 questions of PCM/PCB format. (40 Questions each from Physics/Chemistry/Mathematics/Biology) and 5 questions in English. The exam will be organized through online mode. VIT University will conduct VITEEE 2019 online from April 10, 2019, to April 21, 2019. According to the latest VITEEE Syllabus, the examination is comprised of Physics, Chemistry, Biology, Mathematics & English subjects. The question comes from the Central Board of Secondary Education (CBSE) & State Board of Higher Secondary Education. Now the students are aware of the VITEEE Exam Pattern, So in order to crack the exams easily students should also be aware of VITEEE Exam Syllabus as the questions will be asked from the subjects like Physics, Chemistry, Maths & Biology. To know everything about VITEEE Syllabus click here. General Category- Candidates should have scored an aggregate of 60% in Maths, Physics, and Chemistry in 10+2. SC, ST, J&K, North Eastern states- Candidates should have scored an average 50% marks in Physics, Maths, and Chemistry in 10+2 or its equivalent exam. Now that you are provided with all the necessary information regading VITEEE Exam Pattern. Candidates must follow the VITEEE Exam Pattern and plan their VITEEE study plan accordingly. It will also be beneficial if they practice and take tests online as the VITEEE Exam is conducted only in the online mode. 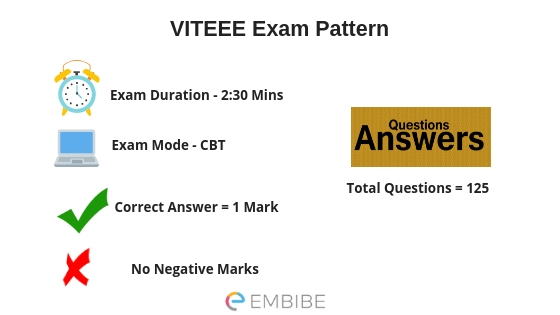 As the VITEEE Exam is conducted only in the online mode, candidates are advised to take Free VITEEE Mock Tests on Embibe as this mock test gives you detailed exam analysis which is much like a personal mentor that guides you all through your preparation, tells you your weaknesses and provides you with instructions to improve. Also, students can take Previous Year VITEEE Mock Test For Free on embibe as it gives you an idea about the question paper. We hope this detailed article on VITEEE Exam Pattern is helpful. If you have any doubt regarding this article or VITEEE Exam Pattern, drop your comments below and we will get back to you as soon as possible. All the best for your exams..!